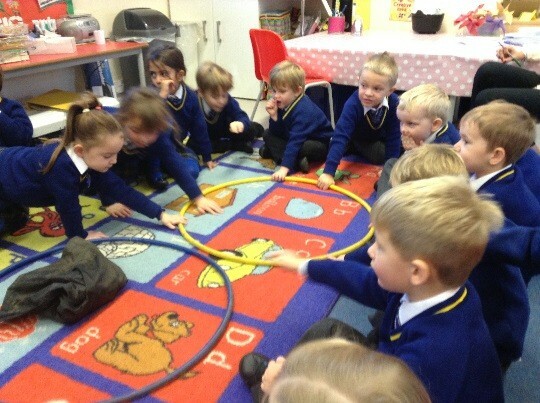 In these dark and blustery days, the Reception classes have been learning about the weather. It’s something we take for granted that a child can identify what the day is like, is it hot or cold? But surprisingly this is a subject which can really get children thinking across the curriculum and using new vocabulary. First the children looked at photographs of different types of weather and talked about what they could see. We discussed the effects of the weather – huge waves and storms, lightning, trees bending and leaves falling or getting sunburnt! We talked about where the children might hear about the weather and see maps such as in the newspaper and on the television and we talked about the symbols we use to represent the weather. We had a selection of clothes for all different weather and seasons and asked the children what they would wear if it was raining or hot or snowing. 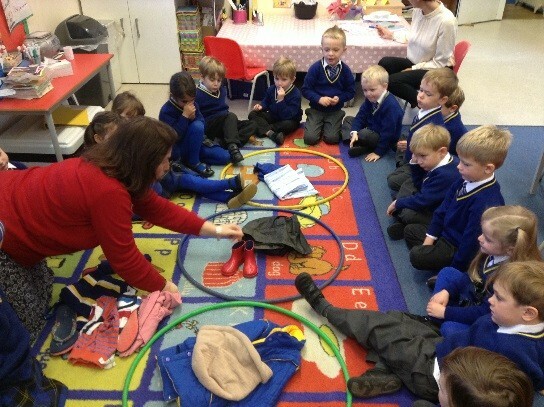 The children then sorted these clothes into hoops in order to categorise the clothes. This encouraged the children to think mathematically and scientifically. The discussions included subjects such as material being waterproof so the rain slides off and keeps us dry and sunglasses protecting our eyes from the sun. So if you get the chance, have a chat about the weather with your children. How many words can they think of for cold? What are the colours in the rainbow? Why do they needs their wellies? What does a hat do?